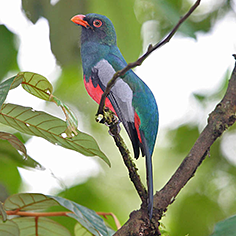 Panama has the richest avifauna of any Central American country with around 976 species. This tour combines the most productive areas including the Canal Zone and now the Darien Gap. Highlights may include Yellow-eared Toucanet, Slaty-tailed Trogon, Lance-tailed Manakin and Rosy Thrush-tanager together with hummingbirds, woodcreepers, antbirds, tanagers and of course, Harpy Eagle! Day 1 Flight from London to Panama City, followed by a transfer to a comfortable hotel close to the airport for an overnight stay. Pipeline Road and Gamboa Pond This road extends for 18 kilometres and has nearly 400 species to its credit! We will look out for swarms of Army Ants while searching for some of the more localised species along the road and in the adjacent forest: Little Tinamou, Pale-vented and Short-billed Pigeons, Mealy Parrot, Garden Emerald, Long-billed Hermit, Black-cheeked, Cinnamon and Crimson-crested Woodpeckers, Plain Xenops, Black-striped, Cocoa and Wedge-billed Woodcreepers, Collared Aracari, Yellow-throated (Chestnut-mandibled) Toucan, Slaty-tailed and White-tailed Trogons, Broad-billed Motmot, Pheasant Cuckoo, Southern Bentbill, Black-faced Antthrush, Streak-chested Antpitta, Chestnut-backed Antbird, Checker-throated, Dot-winged and White-flanked Antwrens, Fasciated and Black-crowned Antshrikes, Black-crowned and Masked Tityras, Rufous Mourner, Dusky-capped, Ochre-bellied, Ruddy-tailed and Sulphur-rumped Flycatchers, Purple-throated Fruitcrow, Golden-collared and Red-capped Manakins, Bay, Buff-breasted and Song Wrens, Brown-capped and Mistletoe Tyrannulets, Black-headed Tody-flycatcher, Blue-grey, Golden-hooded, Palm and Plain-coloured Tanagers, Blue Dacnis, Red-legged Honeycreeper, Fulvous-vented and Thick-billed Euphonias, Blue–black Grosbeak, Scarlet-rumped and Yellow-rumped Caciques and Crested Oropendola. At Gamboa Pond, Least Grebe, Rufescent Tiger-heron, Limpkin, Purple Gallinule and White-throated Crake can all be found. At the Rainforest Discovery Centre, we will enjoy spectacular views of Soberania’s vastness while watching canopy bird species. Standing above the canopy, we will witness the morning flight of Keel-billed Toucans, Red-lored Parrots and the silent and stealthy movement of Mantled Howler Monkeys. The visitor centre is 140 square metres of open structure with terrace, hiking trails and a 32-metre high observation tower with spiral stairs and a rest platform roughly every 7.5 metres. Summit Ponds Boat-billed Herons nest here, while on the way, the road passes through a variety of habitats where Blue Ground-dove, Great Antshrike, Jet Antbird, Great and Lesser Kiskadees and Black-tailed and Royal Flycatchers can be found. Nearby, flowering hedgerows and scrub may hold the restricted-range Sapphire-throated Hummingbird and Northern Scrub-flycatcher. Plantation Road Walking along Plantation Road, close to Canopy Tower, we will look for a great variety of species including Great Tinamou, Bicoloured and Tiny Hawks, Marbled Wood-quail, Great Jacamar, White-whiskered Puffbird, Olivaceous Flatbill, Bay-headed Tanager and Slate-coloured Grosbeak. We will also be on the lookout for a swarm of Army Ants, with which we have a good chance of seeing Northern Barred-woodcreeper, Plain-brown and Ruddy Woodcreepers, Spotted and Ocellated Antbirds and Grey-headed Tanager. Golden-crowned Spadebills are regular around the creek; White-breasted Wood-wrens are easy to see and, if we are really lucky, we may find the shy Sunbittern. Hummingbirds can be found along the road and we may encounter White-necked Jacobin, Black-throated Mango, White-vented Plumeleteer and Blue-chested and Violet-bellied Hummingbirds. We will spend at least one evening looking for owls, nightjars and nocturnal animals. Possibilities include Black-and-white, Crested and Mottled Owls, Choco Screech-owl, Common Pauraque and Common and Great Potoos. Mammals may include Two-toed Sloth, Kinkajou and Rothschild’s Porcupine. Days 5–6 Sadly, we must leave Gamboa but a two-hour drive will take us to Campana and Gaital National Parks in the central mountains, where we have an array of new birds to look for. Cerro Campana was Panama’s first national park; a bell-shaped mountain of about 800 metres elevation, it protects 4,816 biologically diverse hectares. El Valle is located within the crater of the second largest inhabited dormant volcano in the world. The lovely town of Valle de Anton, our base for the next two nights, is situated about 700 metres above sea level and the flora and fauna in the area are completely different to those of the Canal Zone and the climate is more temperate. The last stretch of the road up to Valle de Anton is both twisty and extremely scenic. During these two days we will explore a number of trails searching for the specialities of the area, including Black Guan, Purplish-backed Quail-dove, Yellow-eared Toucanet, the elusive Tody Motmot, Scale-crested Pygmy-tyrant, White-ruffed Manakin, Blue-and-white Swallow, White-throated Thrush, Silver-throated Tanager, Red-crowned Ant-tanager, Rufous-capped Warbler and Chestnut-headed Oropendola. The hills above El Valle are home to the unusual White-tipped Sicklebill, a hummingbird that is attracted to flowering heliconias. This is also a great place to search for Orange-bellied Trogon, White Hawk, Northern Emerald (Blue-throated) Toucanet, Brown-billed Scythebill and Tufted Flycatcher. There is a large variety of habitats in the area and as well as the many trails and tracks, we may visit some gardens with feeders. The list of birds we may see is long but one particular species stands out as a target, Rufous-vented Ground-cuckoo, which is regularly reported here. It will take a great deal of luck (and finding ant swarms) but we will make every effort to find this elusive species. Other birds we may find include Grey-headed Chachalaca, Grey-headed, Pearl and White-tailed Kites, Crested Bobwhite, Plain-breasted and Ruddy Ground-doves, Brown-hooded and Blue-headed Parrots, Brown-throated Parakeet, Green and Little Hermits, Rufous-tailed Hummingbird, White-tailed Emerald, Lesson's Motmot, Northern Emerald (Emerald) Toucanet, Red-crowned Woodpecker, Barred Antshrike, Black-headed Antthrush, Clay-coloured Thrush, Fork-tailed and Social Flycatchers, Yellow-bellied Elaenia, Pale-eyed Pygmy-tyrant, Spotted Barbtail, Rufous-browed Peppershrike, Black-chested Jay, Common Chlorospingus, Black-faced Grosbeak, the Lemon-rumped form of Flame-rumped Tanager, White-lined Tanager, Buff-throated Saltator and Giant Cowbird. Day 7 After spending the early morning birding around Valle de Anton again, we will travel back to Panama City where we will spend the afternoon at the Metropolitan National Park. Here, the forests are much drier than around Gamboa and consequently they support a different range of species. The beautiful Rosy Thrush-tanager is common here, as is Red-throated Ant-tanager. Other birds we may see include Grey and Roadside Hawks, Squirrel Cuckoo, Lineated Woodpecker, Streak-headed Woodcreeper, Boat-billed, Sepia-capped, Streaked and Yellow-olive Flycatchers, Dusky and White-bellied Antbirds, Lance-tailed Manakin, House, Plain, Rufous-breasted and Rufous-and-white Wrens, Tropical Mockingbird, Southern Beardless-tyrannulet, Yellow, Yellow-crowned and the endemic Yellow-green Tyrannulets, Common and Slate-headed Tody-flycatchers, Golden-fronted and Scrub Greenlets, Tropical Gnatcatcher, Yellow-backed Oriole, Crimson-backed Tanager and Ruddy-breasted Seedeater. In the late afternoon we will check into a comfortable hotel close to the airport for a four-night stay. Day 8 Cerro Jefe and Cerro Azul are subject to inclement weather, so we have allowed two days to cover as much of the habitat as possible and can reverse today’s itinerary with tomorrow’s if necessary to ensure that we spend our time as productively as possible. Today, we plan to visit the forests in the foothills of Nusagandi, where we will look for some of Panama’s most sought-after birds. In the mountains along a trail, we will look for the highly-localised Spiny-faced Antshrike. Another elusive bird here is the Sapayoa, a bird of uncertain taxonomy found in the understorey. Other species found in this bird-rich habitat include Swallow-tailed Kite, Semiplumbeous and Broad-winged Hawks, Slaty-backed Forest-falcon, Spotted Woodcreeper, Spot-crowned Antvireo, Dull-mantled Antbird, Black-capped Pygmy-tyrant, Northern Schiffornis, Tawny-faced Gnatwren, Bananaquit, Green and Shining Honeycreepers and Dusky-faced, Tawny-crested and the near-endemic Sulphur-rumped Tanagers. In the afternoon we will visit a patch of woodland in the upper Bayano Valley where we should find the restricted-range Black Antshrike. Day 9 Cerro Jefe and Cerro Azul are home to many interesting species, some of which are only shared with the inaccessible summits of Cerro Brewster and Cerro Tacarcuna in eastern Panama. The top of these isolated mountains are covered with elfin forest where our primary targets are Violet-capped Hummingbird and Tacarcuna Chlorospingus. In addition, we will look for Scaled Pigeon, Violet-headed Hummingbird, Grey-breasted Wood-wren, Long-billed Gnatwren, Slate-throated Redstart, Scarlet-thighed Dacnis, White-vented and Tawny-capped Euphonias, Hepatic and Black-and-yellow Tanagers, Black-striped Sparrow, Chestnut-bellied Seed-finch and Yellow-faced Grassquit. In more sheltered forest patches downslope we may find mixed flocks containing Speckled Tanagers and possibly even the elusive Rufous-winged Tanager. If we are extremely lucky, we may even find a Blue-fronted Parrotlet. Day 10 Today we will head east on the Pan-American Highway to the Bayano Lowlands, which form the westernmost limit for several Darien endemics and specialities such as Barred Puffbird, Orange-crowned Oriole, White-eared Conebill and Green-and-rufous Kingfisher. The edge of the Bayano Lake is good for Cocoi Heron and Pied Water-tyrant. Along the Achiote Road where the habitat is more open, an amazing 380 bird species have been recorded in just one day by the Panama Audubon Society on their Christmas Bird Count. Although we won’t see this number, it is a terrific site for birding and we will focus our efforts on looking for Snail Kite, Lesser Swallow-tailed Swift, Black-throated Trogon, Black-breasted Puffbird, Spot-crowned Barbet, Bare-crowned and Bicoloured Antbirds, White-headed Wren, Red-breasted Blackbird, Montezuma Oropendola and Black-headed Saltator. Day 11 There may be some time for early morning local birding before we return to the airport to catch our lunchtime overnight flight back to the UK with arrival on day 12. General Information The climate can vary from hot and humid in the lowland rainforests to cool in the mountains. Some rain is possible. The tour pace is moderate with generally easy walking, although at altitude some extra effort is needed. There are some health requirements, which should be referred to your GP. Group size Minimum number for tour to go ahead: 8; maximum group size: 10 with 1 leader. Price includes scheduled economy flights between London and Panama City, all ground transport within Panama, accommodation in twin-bedded rooms in medium-standard hotels, all with private facilities, all food except dinner on day one and lunch on day 11, some drinks, entrance fees to national parks and services of the leaders throughout. Excluded are other drinks, departure tax (if any), insurance and items of a purely personal nature.